I am not typically the Lark who gets excited when a new Science Fiction title hits the shelves. (Aimee is our resident SciFi Lark.) In fact, it is probably one of my least favorite genres, but I decided to give this one a try after enjoying previous works by Alexandra Monir. The novel is set in a future where climate change, pollution, and other environmental factors have wreaked havoc on the Earth. Cities have been ravaged by storms, waves have swallowed historical attractions, and the world has become a smaller place as countries put aside old wounds and prejudices to band together to find a way to save the human race. As Earth continues to turn on its inhabitants, space may be the only place with a new home that can save us all. The world's top scientists and astronauts are seeking six talented and courageous teens to begin a new colony on Europa, one of Jupiter's moons. The story is told through two main narrators: Leonardo (aka Leo) from Rome, Italy and Naomi from the United States. Both of these characters are drafted to begin the rigorous training that the final six will need before embarking on their dangerous and historic mission. Leo is not sad to leave behind Rome buried underneath the waves as it no longer has anything for him. His family was killed in the giant waves that engulfed his city, so heading into the unknown is as good a plan as any as far as Leo is concerned, but Naomi doesn't share his enthusiasm. She never wanted to be drafted, but her aptitude with science, math, and technology have made her an asset to the program. Naomi has something to stay behind for - even if it means her own death - because she cannot imagine a world without her parents and younger brother. She has dedicated her studies to understanding her brother's heart condition and working to find a cure, but everything is derailed when she receives her draft summons. Leo and Naomi are sent to Houston where along with twenty two other teens they are put through strenuous training, stressful simulations, and grueling exercises. The goal is to determine which twelve have what it takes to advance to the next level. 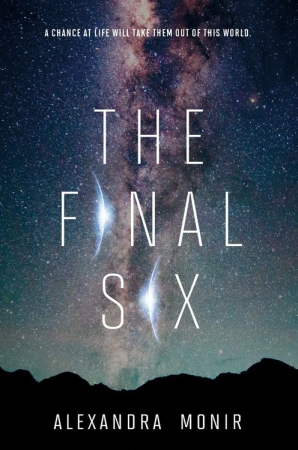 Naomi decides that she has to find proof that the Europa mission is not as innocent as it seems while Leo determines that he will do everything in his power to make sure he has a spot on the mission. The pair begin a friendship that will lead them down some dark and windy paths. I could tell from the moment that Naomi and Leo arrived in Houston that something sinister was afoot. I hope the next novel delves more into Naomi's suspicions and things she discovers through her investigations in this novel. There are so many directions this could go in. While there is a heavy dose of science fiction present, I think others like me who don't always find this genre to be their cup of tea will enjoy this one. There are so many other elements that kept me glued to the pages. Dystopian fans and those who like a strong female lead will love this one. There is also enough mystery and romance to keep readers like me hooked. One Last Gripe: I didn't like that we never truly got a resolution concerning Naomi's roommate. Favorite Thing About This Book: I loved watching Naomi's intellect in action. First Sentence: A funny thing happens when you have nothing left to live for.